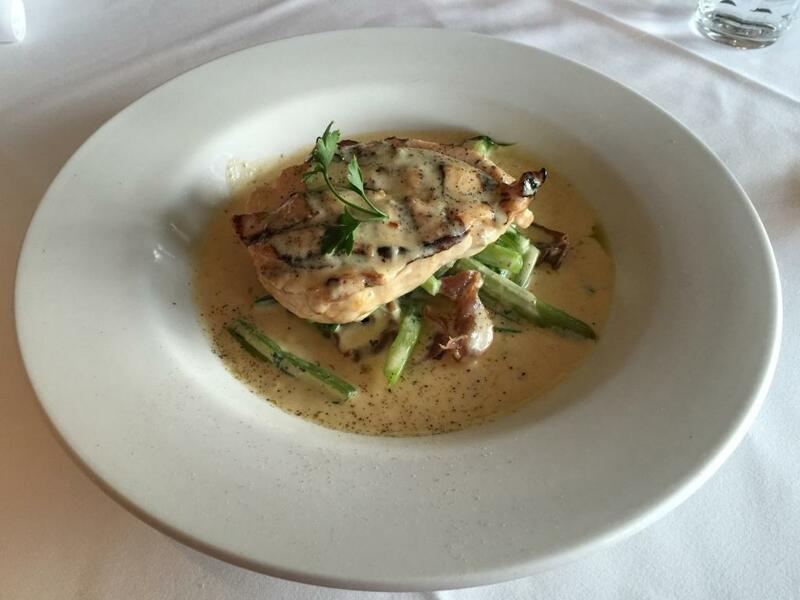 Grilled skin on chicken breast with sautéed spinach and prosciutto and a Gorgonzola cheese sauce finished with fresh herbs. In often hesitant to order chicken, as it can be bland and boring. This chicken is very different. The melted Gorgonzola on the chicken gives it a salty taste like macaroni & cheese. The cheesy sauce in the bottom of the plate adds a nice lemony tang too. The only problem with this dish is the prosciutto under the spinach. It's inedible salty. However, it's only s minor component, and is easily dodged. The proprietor explains that they haven't added any salt. Proprietor: "The salt is dependent on the animal's diet." Cold set hazelnut & Italian nocello liqueur cheesecake served with a rich dark chocolate ganache. Hazelnut is a slightly odd component of a cheesecake. It's not a Nutella flavour. It's just actually hazelnut pieces. 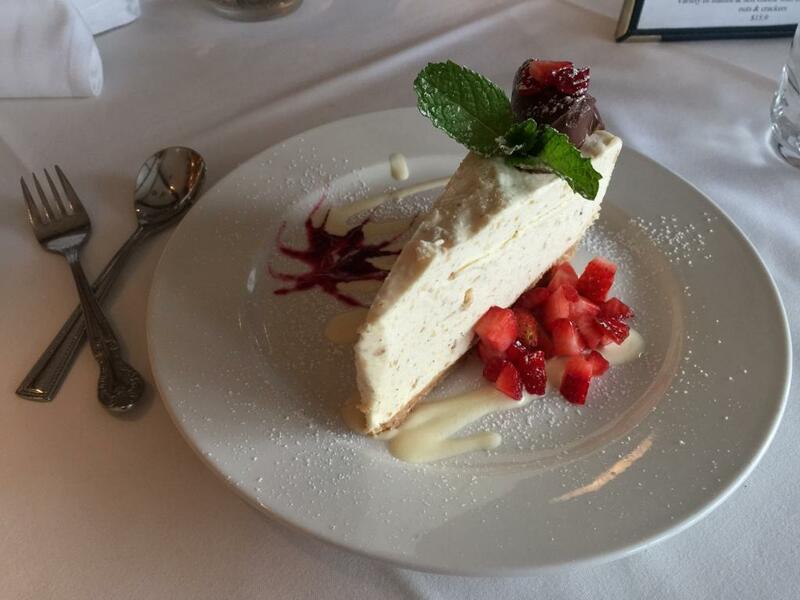 The cheesecake isn't particularly sweet, and this odd taste needs sweetness. There's a kind of berry coulis on the side, but it's taste (which is almost undetectable) doesn't matter. There's just too little of it. The fresh strawberries don't add enough sweetness or flavour either. The chocolate ganache on top is almost exactly like Cadbury's chocolate, but in paste form. It doesn't add enough taste on its own. This ganache lacks panache! I give the proprietor my feedback. "Wait a minute," he says. "I get some nocello." He pours it onto the remnant of my cheesecake. I eat it. It's the same cheesecake, but with a slight alcoholic flavour. "It doesn't really add any sweetness" I reply. "Wait a minute," the proprietor says. He returns with a bottle of Frangelico, and pours some of that over the already-doused cheesecake remnant. The cheesecake is still the same cheesecake, even with two different liqueurs on it. We then have a yarn about food for a few minutes. The proprietor is an entertaining and informative, if over-the-top, Italian. He tells me about cheese and meat, and bids me arrivederci as he holds the door open for me on the way out.